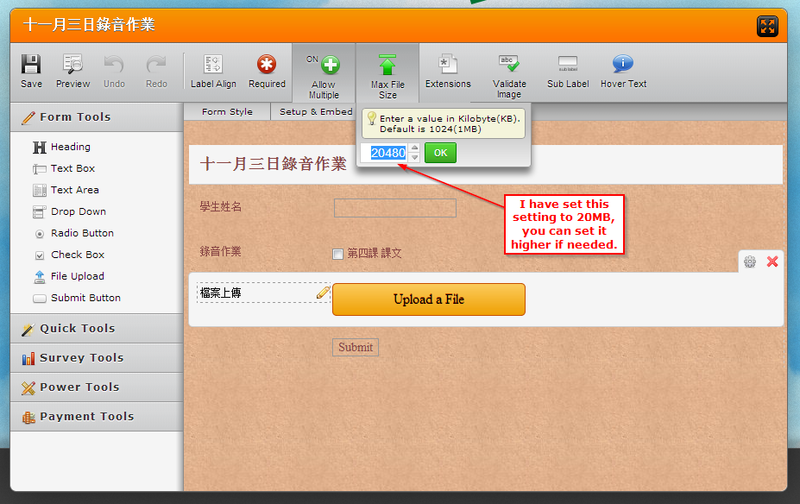 My JotForm is for students to upload their recording assignments. The problem is the JotForm has bug. Students can not upload the wav file. After reviewing the form, I do see that there are a few needs to be considered, the upload field is not set to required. Also wav files tend to be large in filze size as the audio is no compressed. So you must allow a higher file size to be used on the upload tool. Specially if the field is not required. What will happen is the file may be too large and it will be discarded, the form will get submitted without the file because the upload tool was not required. At this time I have set is to 20MB. I uploaded a 15MB Wav file and went through properly. Kindly let us know if you need further assistance. Thank you.